24 Wister rats were taken in 4 groups. The dorsal hair portion of all the animals was removed. fourth group was maintained as control. Pattern of hair growth in all the groups was observed daily and hair growth initiation time and hair growth completion time were recorded. 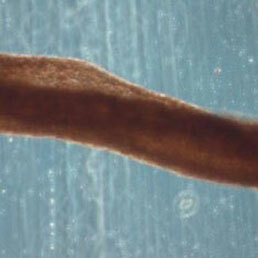 Hair growth completion time was found to be reduced by 30% in Anagen grow treated group of animals. 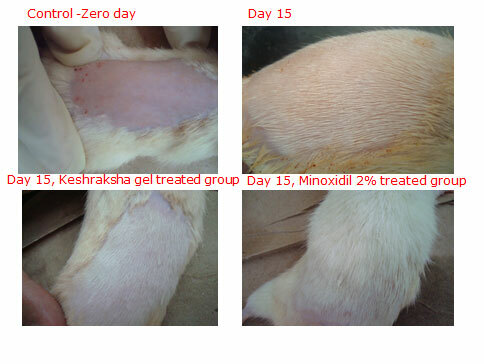 whereas the hair formed in Minoxidil treated animals was rapid, long, thin and highly irregular. This study was carried out to assess Anagen grow in the treatment of hair damage for repairing and protecting. Then extent of damage and change in the hair morphology was observed through phase-contrast microscope at different time intervals. The damaged hair was taken and to which the Anagen grow was applied completely and left for 2-10 minutes. The hair was the washed with distilled water and pat dried. 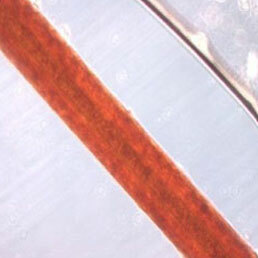 Few hair were collected and placed over the slide and was observed under the microscope. The hair tresses were pre-treated with the Anagen grow for few minutes (2-10) and washed with water followed by various treatment procedures to damage the hair. The damaged hair was washed with water and pat dried and then observed under the microscope. Anagen grow treatment form an adhesive coat on the damaged hair. Dryness and frizyness of the hair decreased. 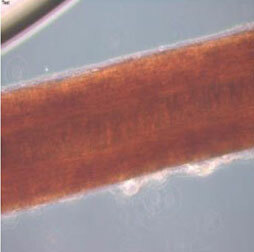 Pretreatment with Anagen grow results in forming adhesive layer which on damage with KOH protects the hair. The damage is less compared to post-treatment. Protection and repair/recovery of hair shaft damage is much needed benefit in today’s circumstances of high pollution, heat conditions. The study findings show regular application of Anagen grow can protect hair from damage and also repairs the already damaged hair.